Now let us talk about a place where sophisticated food and delicacies would be prepared and served to a select minority: the palazzos of the wealthy. There are two aspects to Palazzo Mansi. It is an emblematic example of the many patrician residences in Lucca and also a national museum that houses numerous paintings, an art gallery. Many of the paintings portray products that were cultivated in the territory in the past (and are still cultivated today) and the commercial activities and customs that went hand-in-hand with the products. The palazzo is located at Via Galli Tassi, 43. The exterior of the building with its light-coloured plaster walls and rather insignificant shuttered windows does not, in any way, exhibit the Baroque magnificence of the interior nor the precious handmade articles also found within. This is typical of the reserved nature of the Lucchesi: an apparent simplicity that slowly disappears as a visitor makes his way into the interior, room after room, floor after floor. Let us proceed slowly. We cross the loggia and enter through the portafinestra of the ground floor into a large room that leads, on one side, to the stairs that access the upper floors and on the other, through walnut doors, into the so-called summer apartments which today contain paintings and in one area, antique looms inherited from the workshop of Maria Niemack where rustic textiles were produced. The looms are still being used today by permission of the Polo Museale della Toscana and thanks to a number of weavers that continue to keep this ancient local tradition alive. In this first room, near the stairway, there are two paintings dating from the first half of the 18th century. The one on the left interests us the most given the subject of our tour; the other depicts the genealogy of the Mansi family and the entry through the city walls as seen from Borgo Giannotti. The first picture shows Villa Parensi or rather the Lucchese concept of a “palazzo in villa”. It is the visual exemplification of what Latins conceived to denote a “villa”: a very large property (estate) with houses and outbuildings, farmland and woods centered round a large country house (or mansion) with gardens and grounds delimited by a perimeter wall. Farm activities were fundamental as the estate was largely self-supporting. Various crops were thereby cultivated, wine and olive oil produced, animals reared, and of course, hunting abounded in the woods of the estate. The area inside the perimeter wall was a place of rest and relaxation. The owner, while awaiting the fruits of the land, which was a very different paced activity in comparison to conducting business in town, could invest energy on intellectual activities if he were so inclined. Landowners could dedicate themselves to the liberal arts (literature and science). In fact, in the painting, there are extremely detailed images of farmers, fishermen, peasants, and courtyard and work animals immersed in fields where local crops are being cultivated. The same places and types of production can be found, described minutely, in an unpublished manual of agriculture written by Antonio Samminiati. It is stored in the Archivio di Stato. Samminiati was a 16th-century Lucchese aristocrat who, while on his estate, wrote a comprehensive, multi-chaptered manual containing exhaustive instructions as to where to best locate an estate, the type of palazzo to build, how to build it and other necessary outbuildings, the appropriate crops to be cultivated given the type of land, and the correct methods to till and sow the different types of soil. The Mansi family had come into possession of this estate after a son had married into the Parensi family. In the 17th century, the Mansis had accumulated their maximum wealth and had the highest social status among the Lucchese aristocracy thanks to a lucrative commercial activity in silk, unscrupulous marriage strategies, and diversification of revenue by investment in land holdings and farming activities. Ascending the stairs we reach the piano nobile, and the initial simplicity we encountered transforms into luxury. In particular, the visitor is struck by the opulence of the Baroque trompe l’oeil frescoes on the ceiling and walls of the centrally located Music Room. These frescoes were part of an overall elaborate renovation desired by Raffaello Mansi and carried out between 1686 and 1691. The artists Gian Gioseffo dal Sole and Marcantonio Chiarini were the creators of this pictorial pomp that describes mythological scenes, subliminally tied to various events in the life of the Mansi family. In fact, in those years, the family had established a new family relationship with the wealthy and powerful Pepoli family of Bologna by way of the marriage between Carlo Mansi and Eleonora Pepoli. Even in these mythological stories everything begins with an apple: the apple of discord. The golden apple obliges the shepherd Paris to choose the fairest of the Olympian goddesses but in so doing, inflicts wrath from the banquet of the gods on the human world. As an epilogue, Troy is defeated and destroyed by flames set alight by the shrewd Ulysses. A clear metaphor to show the Lucchese aristocracy what a glorious future awaited the family by way of the new union between the Mansis and the Pepolis. A union powerful enough to sweep away old provincial stories of the past and create a new fertile progeny of glory, just like the frescoed image of Aeneas who brings his seed to Italian shores in order that his progeny can give rise to the founding and glory of Rome. From the Music Room, we access four rooms that house a collection of paintings that are from the Palatine galleries of Florence and were donated by Grand Duke Leopold of Tuscany when Lucca was annexed to the Grand Duchy of Tuscany, of which Florence was capital, on 4 October 1847. In the last room, there are two small paintings done by Flemish Bamboccianti. One is particularly captivating because it portrays a country scene where poor peasants, completely ignoring a pilgrim’s request for a handout, are ravenously eating spaghetti or fresh pasta with their hands directly from the earthenware pot still full of the cooking water. It is like a famous scene from the 1954 film starring Totò called “Miseria and Nobilità”. This comical scene is tied to the poor conditions of the Neapolitan working class. When spaghetti is brought to the table, an entire family voraciously eats it, with no restraint or inhibitions. This was Italian street comedy, grotesque, a parody based on the concrete reality of poverty, hunger, and basic human needs that could be found in the streets of every Italian city from north to south of the “Bel Paese”. From Pulcinella to Harlequin, between a ruse and guile, hunger was always the constant. Pietro Paolini, the 17th-century Lucchese painter, would “stage” with incredible realism the more humble classes, those of people that had no means of redemption other than through religious faith or faith in a benevolent state or protector like the Republic of Lucca. 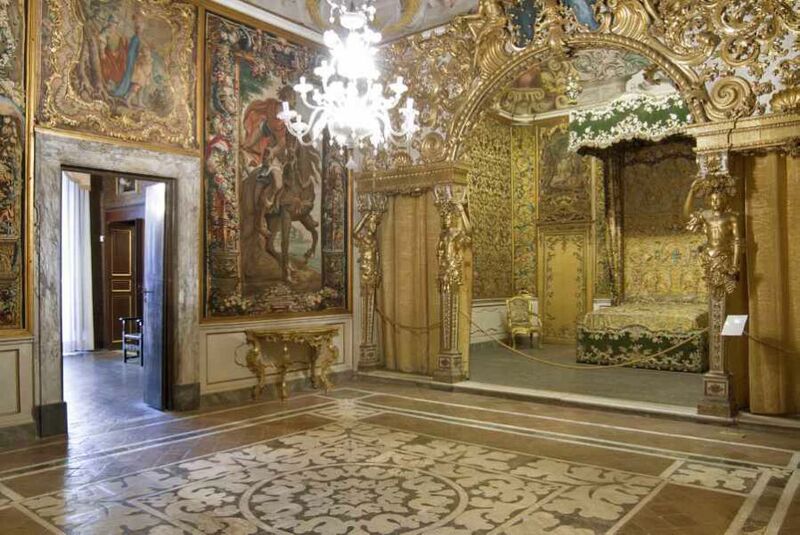 Two of these paintings are in the room following the dazzling and opulent Bridal Chamber and alcove. The poultry vendor and the chestnut vendor. The first painting is a close-up of a poultry vendor. He is looking directly toward the observer and is holding up three fingers to indicate his asking price. His “screen” presence is captivating. The other canvas is of a roasted chestnut vendor. His rough hands, fingers blackened by ash, and face reveal the lower-class status of street traders especially the ones selling the staple product of the mountains of Lucca: the chestnut. The chestnut could feed entire populations to the extent that local inhabitants designated the chestnut tree as “the bread tree”. By virtue of its frequent revamping following the latest trends and taste, Palazzo Mansi was chosen by the Republic of Lucca to host visiting dignitaries throughout the 18th century. The Prince, soon to be King, of Denmark was a guest as were, in 1785, the monarchs of the Two Sicilies. The banquet prepared for the latter and their entire court was remembered in the city chronicles of the time. Countless courses were served and for the first time, ice cream (gelato) was presented. In fact, so much ice cream had been prepared that, at the end of the meal, it was offered to the locals crowding the nearby streets. 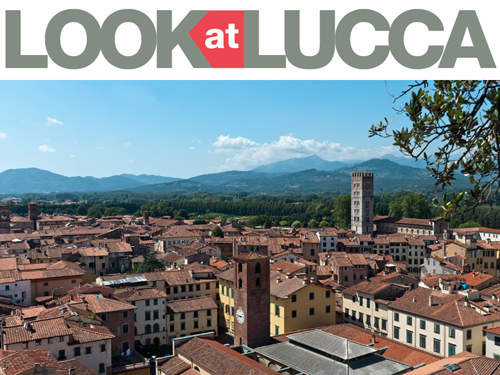 This itinerary has allowed us to visit some of the places in Lucca that are linked, in varying ways, to food and to taste: places of worship, antique shops, squares where markets were held, and the palazzos of the powerful. Have we forgotten anything? As a matter of fact, one thing has been left out and it is not of secondary importance. Actually….it is fundamental: places where food can be eaten and savoured, the trattorias. 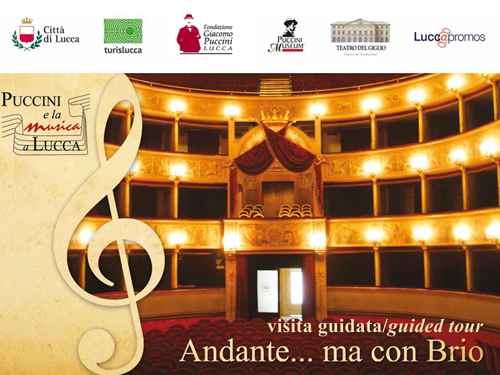 Posted in Blog ed etichettato arts, food, Lucca, museum, Palazzo Mansi. Bookmark the permalink.